Stay cool in this summer with some of the best 14,000 Btu portable air conditioners. Pick the wrong one will waste your money and will make you feel uncomfortable, so we’re here to help you find the best. In our search, we focused on finding one that uses every watt effectively, helps you cool your room quickly, has a quiet operation and has a fair initial cost. Portable air conditioners are great cooling solutions for bedrooms, living rooms, offices, and garages without access to central AC. They’re also intended for rooms in which window configurations or building regulations prevent installation of window units. Portable air conditioners offer flexibility than window air conditioners since they don’t require permanent installation and can be moved from room to room. It’s important to buy a portable AC that’s appropriate for your space to make sure you don’t waste energy or waste your money on one that can’t adequately cool your room. 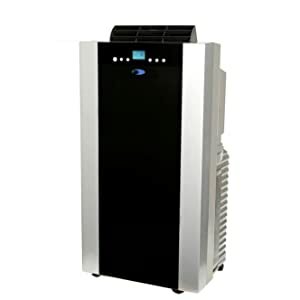 As a rule, a 14000 Btu portable air conditioner is designed for cooling a large or very busy room approximately 500 to 550 square feet, such as family room or office. Noise is the most common problem portable air conditioners have but is also one of those that we hardly ever consider when purchasing. Some portable air conditioners list the decibel rating of the system at each fan speed. You can compare these ratings to other indoor appliances such as vacuum cleaners (70-75 dB) or lawn mowers (85-90 dB) to know exactly how loud they are. If you’re seriously concerned about noise in your room, we suggest you check out our guide for the best quiet portable air conditioners. One of the most important things to determine when choosing a portable air conditioner with over 14,000 Btu is the energy efficiency. Because a typical 14000 unit consumes about 1.25kW to 1.7kW per hour, it can make a big difference if you choose a more efficient unit. Efficiency is measured by the portable AC’s Energy Efficiency Ratio (EER), the higher the EER, the more efficient the model. The best portable ACs should have an EER above 9.7. A rating of 10 or more is typically considered a very good rating for portable ACs. No matter which option you choose, every portable unit must draw air in from one vent and then exhaust it from another part of the machine. If your portable unit can’t do it well, it actually makes more heated air than it does cool air. The efficient removal of heated air is absolutely necessary if the room is to be cooled. A dual hose unit cools an area more efficiently and quickly than a single hose unit does. However, a dual-hose unit may use two internal fans, which may also result in slightly higher energy usage. And it also costs a bit more. 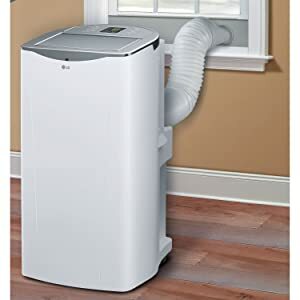 If you intend to use the unit in a room with computers or even a wine cooler, you’ll want to choose a dual hose portable air conditioner. If you’re looking for an affordable unit that will meet your basic cooling needs, a single hose portable air conditioner is a better option. Does it have a heat mode? While the weather may have turned cold, that doesn’t mean you can’t still use your portable air conditioning unit. You can get a unit that offers a heat mode, so you can enjoy the warm air in the winter months. This type of portable air conditioners is slightly more expensive than the one without a heat mode. If you’re looking for a dual hose portable air conditioner that comes with a reasonable price, the Whynter ARC-14S is the best option to buy. It’s quiet, powerful, energy-efficient, and can be easily setup. In fact, it recently received high ratings from a top consumer reporting agency. This 14,000 Btu portable air conditioning unit combines cooling and dehumidifying power with environmental awareness very effectively. It’s designed for cooling a large room up to 500 square feet with a dehumidifying capacity of 101 pints per day (4.2 pints per hour). It uses a thermostat which controls the compressor of the air conditioner. When the set temperature is reached, the compressor of the unit turns off but the fan continues to run to circulate the air inside the room. Plus, it features an auto-restart function which it automatically restarts on the previous settings after power outage. The Whynter ARC-14S is an eco-friendly portable air conditioner that has minimal environmental impact. For ecological cooling, this unit uses a CFC-free refrigerant and contain lead-free RoHS compliant components. It features advanced self-evaporating technology, which uses and recycles moisture collected during the cooling process to produce cool air and minimize condensate build-up. The Whynter ARC-14S uses a two hoses installation system, which helps to cool your space quickly and efficiently. By drawing warm air from both inside and outside, it is possible to convert the warm air into the cool and clean air, while expelling the warm and humid air through the exhaust hose at the same time. This creates improved airflow and efficient cooling. Even though this unit has dual pipes, the installation is not difficult. Full instructions are given in the owner’s manual and the unit comes with a window kit which has all the necessary fittings needed for a faultless installation. 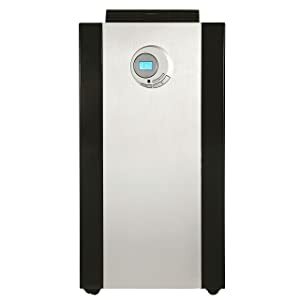 Overall, for those who are looking for a powerful and efficient 14,000 Btu portable air conditioner, the Whynter ARC-14S is the best option available. If you want a unit with a heat mode, grab the Whynter ARC-14SH – this unit distributes 13,000 BTUs of heat per hour. The EdgeStar AP14001HS is one of the most powerful AC units on the market for larger spaces up to 525 square feet. With dual hose design allows for more air intake, this unit cools an area 40 percent quicker than single hose models. The added heat function makes this unit versatile for year-round comfort, no matter what the season. It can heat up to 400 square feet. As mentioned above, the best portable air conditioners have energy efficiency ratio (EER) above 9.7. This 14000 Btu unit has an impressive EER of 11.2 – which is the highest rating in our comparison review, meaning it consumes significantly less energy than others in its class. This is the most efficient unit we reviewed. 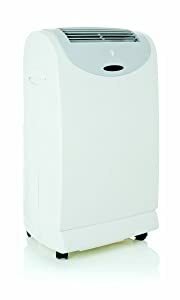 Another great feature of this EdgeStar 14,000 BTU portable air conditioner is that it is an environmentally friendly AC. Like our top pick, this unit uses no ozone-damaging R410A refrigerant and meets new RoHS standard. The RoHS directive aims to restrict certain dangerous substances commonly used in electronic and electronic equipment such as lead, mercury, and cadmium. With the advantage of also being used as a dehumidifier, this EdgeStar model offers a direct drain option so the unit may continuously expel the moisture into a nearby drain in your area negating the need to manually empty the holding tank. This unit also has 3 settings for cooling and fan speeds and a 24-hour timer program. For those looking to cool a master bedroom with high ceiling, this is a good pick. 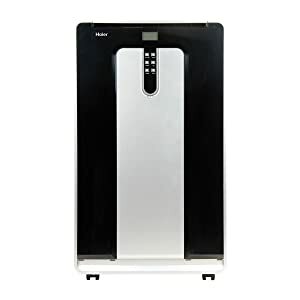 With a super quiet operation (50 dB on low setting), the Haier HPN14XCM 14,000 Btu is the best quiet portable air conditioning unit in our comparison. It will keep you cool at night without disturbing you. This 14,000-BTU portable air conditioner is ideal for spot cooling larger rooms up to 500 square feet. It’s single-hose model with three cool settings, three fan settings, a 24-hour on/off timer and dehumidify mode. And it also comes with a remote control that includes an LCD screen, which allows you to easily see the air conditioner’s current settings and change them as you need. This unit is heavy and large, so if you live on the top floor of an apartment building, lifting it up the stairs will be a chore. Its energy efficiency ratio (EER) is only 9.4 – which was the worst of the group but that still doesn’t mean it’s going to cost you a lot more. That difference could be around $6-$10 more years to run, depending on your usage and the electricity rates in your area. Humidity is most often used to describe how a person feels, often in conjunction with heat. If it is hot and humid, a person will usually feel much more uncomfortable. When the air is humid, evaporating the moisture becomes more difficult and the actual cooling effect is much smaller. The Honeywell HL14CESWK HL Series comes with full humidification functionality cools a large room very quickly and will help you stay cool and dry during those hazy days. This single hose portable air conditioner provides 14,000 BTU’s of cooling power is designed for a large room up to 550 square feet and has a no-drip design, auto-evaporation system for hours of continuous operation without the bother of emptying a bucket. This unit can remove up to 111 pints of moisture per day (4.625 pints/hour) without additional cooling. That is the highest rate of moisture removal in our comparison review, which makes it the best option if you live in a humid climate or a humid space such as a basement. Featuring a digital LED display and full-operation remote control with a programmable timer puts you in command of the summer heat. Just set anywhere from 61 to 89 degrees for your optimal comfort and program it to turn on or off for ultimate convenience as well as energy savings. This portable air conditioner comes with everything needed including a flexible exhaust hose and an easy-to install window venting kit. 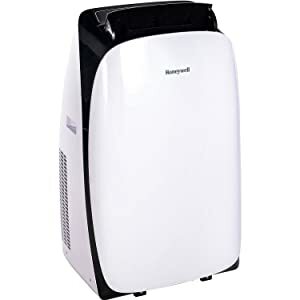 Comes with an affordable price, the Honeywell HL14CESWK HL Series 14000 Btu portable air conditioner is the best option for large areas with high moisture level such as basements or living rooms. We love this Whynter 14,000 BTU Dual Hose portable air conditioner because it comes with the 3M Antimicrobial High Air Flow (HAF). The 3M Antimicrobial HAF offers while the 3M microstructure design and electrostatic charge provide effective particle capture. This may translate to fewer filter change-outs as compared to alternative dust filters, reduced coil cleaning, and/or reduced maintenance cost. Antimicrobial agent incorporated into filter media helps inhibit the growth of mold and mildew on the filter media. With 100% synthetic media and seamless adaptability to a variety of existing equipment configurations, these filters can be a great choice for your air filtration efforts. This Whynter unit is designed for specialized commercial applications in mind, it is ideal for use with server rooms, data centers, wiring closets or any space where high-efficiency cooling and low maintenance is a requisite. This unit can cool up to a 500 sq. ft. space (ambient temperature and humidity may influence optimum performance). Eco-friendly design uses ozone-friendly refrigerant and low power consumption. One of the best things about this 14,000 Btu portable unit is the super convenient self-draining system. With that system, you practically never have to dump the condensate bucket. This innovative drainage method turns collected water into an ultra-fine mist and releases the mist droplets outside. All you have to do is place the spiral water pipe into the exhaust hose, connect the water atomizer to the end of the pipe, and voila, true set-and-forget operation is yours in a snap. The Whynter is a bit more expensive than others in its class, and it also louder than other options in our comparison. But this unit is still a very good option to consider. Friedrich is one of the best air conditioner brands in the world. Constructed from the highest-quality materials and components, Friedrich’s air conditioners are built to exacting standards, yet they are among the quietest and most energy-efficient available. Friedrich PH14B ZoneAire provides four distinct functions in one convenient unit: air conditioning, dehumidification, fan and heating (heat pump model only). It’s ideal for supplemental cooling or heating. With dual hose design, it provides up to 40% faster cooling and greater energy efficiency than single-hose units. This unit also meets the latest Energy Star standards, so it requires 15 to 20 percent less energy than other units without that certification. This unit provides 13,500 Btu of cooling capacity but it can cool a room up to approximately 700 square feet. Making it the best cooling solution for a large room. It provides 10700 Btu heating capacity. This unit is also very easy to install and move around. The convenient window slider kit included with each unit fits both horizontal and vertical window openings between 26″ and 46″, and can be trimmed to fit even smaller openings. This unit is one of the most expensive portable air conditioners on the market. It can cost twice as much as comparable units. If the price is important in your choice of portable air conditioner, the SPT WA-1420E Portable Air Conditioner may be what you’re looking for. The price of this unit is low compared to other portable units on our lineup. However, it comes with many great features that are worth considering. This unit provides 14,000 BTUs of cooling power to cover spaces up to 700 square feet, so it’s ideal for large residential spaces like living rooms, basements, attics, and other oversized rooms. In addition to cooling, it also has a separate dehumidify function and fan-only operation. It uses non-ozone-depleting R410A refrigerant and is made with all RoHS compliant components that are free of harmful chemicals. This unit has an energy efficiency ratio (EER) of 8.9. That is relatively low compared to other portable air conditioners on the market. So running this unit may cost you a bit more than others. However, this unit is relatively quiet – it produces only 51 dB on low setting and 56 dB on high setting. 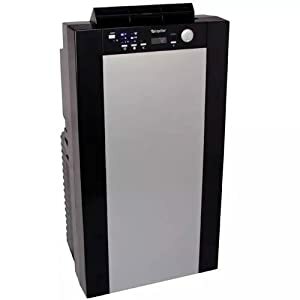 If you’re looking for a quiet portable air conditioner for cooling a bedroom that has a low price, the SPT WA-1420E may be the best option available. This 14000 Btu portable unit also has some convenience features such as a programmable timer, digital display, auto-swinging louvers, and a continuous drainage option. Continuous drainage is much more convenient since you’ll never have to empty the bucket. It’s a popular option for customers looking for a low-maintenance cooling system that doesn’t need to be manually drained. If a smart air conditioner is what you’re looking for, enter the LG LP1415WXRSM, it doesn’t come cheap but it’s easy to install and can be controlled using a mobile app. Unfortunately, this LG model can’t work with Amazon’s Alexa and Google Assistant voice commands. If you want a unit that can be controlled by your voice, grab the Frigidaire Gallery 12,000 BTU Cool Connect portable AC– which is one of the best 12,000 Btu air conditioners on the market. This unit is designed for a room up to 500 square feet with dehumidification up to 3.4 pints per hour. 3.4 pints per hour isn’t the highest rating of moisture removal in our comparison, but it’s higher than many others we reviewed. This portable air conditioner is noisy. In our latest tests, this unit produced approximately 59 dB on low setting and 65 dB on high setting – which was the worst of the group. In term of size, this unit is relatively small and lightweight. You can move it from room to room, house to house without any difficulty. Overall, the LG LP1415WXRSM 14000 BTU Portable Air Conditioner features a new set of Wi-Fi connectivity options that make it easy to control your A/C from anywhere, as long as you don’t mind a little extra noise by the time you finally get home to enjoy it.